Finally, Rohit Sharma has confirmed that he is likely to open the innings in nearly every game for the Mumbai Indians in IPL this season, sure to start off with, at least. Following a number of seasons where Rohit plied his trade from the middle order, the influential Mumbai captain has decided its time to move back to the position best suited for him. With a fragile middle order during the earlier seasons, Sharma had to carry the burden of the team's innings on his shoulders, thus having to relinquish his position as an opener. However, with the inclusion of experienced names such as Yuvraj Singh and the decent form of Kieron Pollard in the PSL leading up to the IPL, the MI skipper has opted to take his place as the opener. Add to it the upcoming World Cup too, and Sharma probably doesn't want to experiment too much at this stage. Last year, Rohit Sharma had his worst season overall, failing to fire regularly playing in the middle order. As such, this is a welcome decision for MI supporters, with lots of pundits having had called for this a lot earlier. Once set, the destructive ability Rohit Sharma brings to the table is second to none. "I have in the past batted in the middle order and I've opened also in a few games so wherever the team requires me to bat I have to bat to get the right balance, But this year, I will open the batting for all the games, that is for sure. 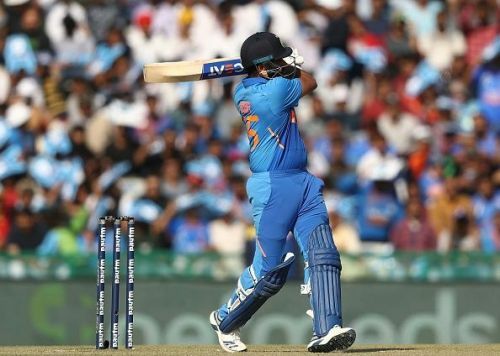 That (World Cup) is one of the factors but also keeping in mind that this is where I bat, that is my position when I play for India and that is where I have got a lot of success of late". "The team does understand that, and as a team also the composition of the players we have right now, we've got some experience in the middle order so that allows me to go and bat at the top of the order. This season I'll try and do that - open in every game possible." Rohit said, speaking at one of the pre-tournament pressers. With experienced heads Yuvraj Singh and Kieron Pollard now manning the middle order, the entire MI batting line-up looks explosive and complete. They will surely be a team to watch out for ..